One of our favorite mommy blogs My Silly Monkeys is doing a Butterscotch Blankees giveaway! They were also nice enough to write a very nice article about our blankets, you can read an excerpt of the article below. You can also enter in the contest here as well as read the full article. Enjoy! During the Holidays we did a Butterscotch Blankees Review. If you read the review you will see how much I love personalized gifts and how impressed I was with the quality and workmanship on these blankets. Now you can begin to imagine how absolutely ecstatic I was that they wanted to take part in our #BabyLove event! Aren’t these baby hats absolutely adorable? Since I am not going to find out what baby is I decided to choose a personalized blanket for Princess Dot. Her birthday was coming up and she keeps stealing RyRy’s Butterscotch Blankee so I knew she would love one of her own! These blankets come in the cutest packaging ever! They look just like a piece of butterscotch candy and are perfect for gift giving on birthdays, holidays, baby showers or just because. When we received it I actually got a little misty eyed. It’s PERFECT! I love the way her name looks on her owl blanket just like I loved the way Rylen’s looked on his Personalized Guitar Blanket. I think Dot’s face says exactly how she felt about receiving her adorable owl blanket. She was so excited! The quality is absolutely amazing, there are absolutely no flaws and I’m super excited to say that the blankets wash up very nicely. There is absolutely no shrinkage or fading, so the blanket you receive looks just as nice once it’s washed. These blankets are going to last for a very long time! For Dot’s blanket I can ditto that statement 100%, well with the exception of that she spelled Zylie’s name right on her blanket. I really wish they made giant blankets for my bed because I may or may not try to cuddle with Ry or Dot’s blankets! They do offer 400 or 1000 count Duvet and/or Shams for purchase but I love these handcrafted blankets more. Thank you for reading, and don’t forget to sign up for the giveaway! 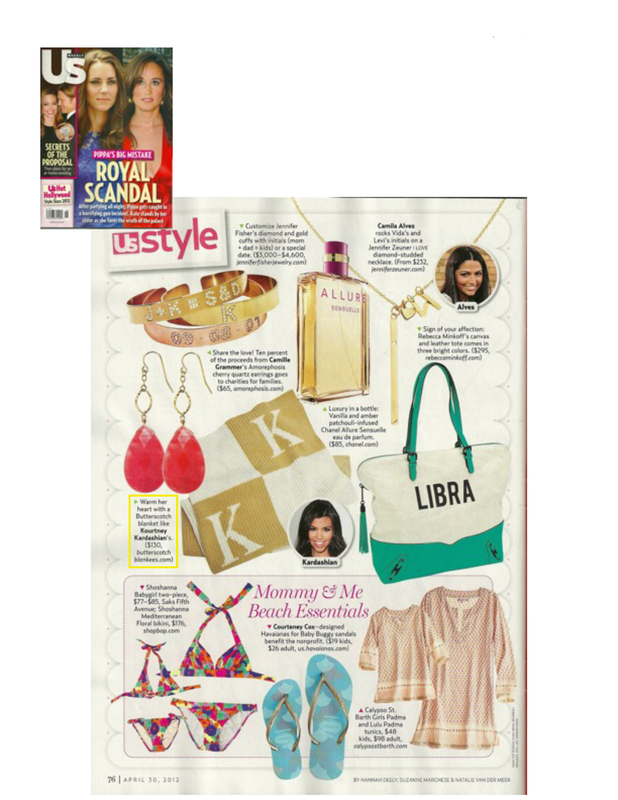 Butterscotch Blankees in Us Weekly! So exciting to have Kourtney Kardashian’s approval of our products, she has fabulous taste!